Leaked documents from the French Directorate of Military Intelligence (DRM) have shown that "Saudi Arabia and the United Arab Emirates are overwhelmingly dependent on Western-produced weapon systems to wage their devastating war in Yemen," The Intercept reported Monday, and that Saudi forces suffered incompetence as carrying out operation on the ground. The catalogue of weapon systems is just one revelation in the DRM's classified 15-page report, which was obtained by the French investigative news organization 'Disclose' and published in full by The Intercept website. Saudi Arabia has been leading a military coalition in Yemen since 26 March 2015, in support of forces loyal to President Hadi to retake areas controlled by Houthi (Ansarullah) group seen as proxy for Iran in the Arab Peninsula country. Many of the systems listed are only compatible with munitions, spare parts and communications systems produced in NATO countries," added the website, meaning that the Saudis and UAE would have to replace large portions of their arsenals to continue with Russian and Chinese weapons. "You can't just swap out the missiles that are used in US planes for suddenly using Chinese and Russian missiles," The Intercept quoted Rachel Stohl, managing director of the Conventional Defense Program at the Stimson Center in Washington, D.C. According to the website, the report is in conflict with what the US President Donald Trump has said that Saudis and UAE would turn to Russia and China to supply their arsenals, if his administration responded to Congress pressures calling for arms sales stop over the war in Yemen and the murder of Jamal Khashoggi. Since the beginning of the war, the US has backed the coalition bombing campaign with weapons sales and, until recently, midair refueling support for aircraft. US Central Command strongly denied that US drones have any operational role in coalition targeting. But the French report suggests that US drones may also be helping with Saudi munitions targeting. Though Washington has denied engaging directly in hostilities against the Houthis, American MQ-9 Reaper drones have flown over Houthi occupied territory. After the Houthis shot down one of the drones in October 2017, it led to speculation that the US could be using them to collect intelligence for the Saudis. Targeting being effectuated by American drones could mean that US drones play a more active role in coalition targeting, like laser-sighting precession-guided munitions drops, for example. Despite their vast technologically superiority, the Saudis in particular are failing to meet their military objectives, the report says, identifying Saudi targeting is in need of improvement. And it describes the Saudis as less effective participants in air and sea missions, noting that the Emiratis are largely responsible for the blockade. The French intelligence report also describes a massive operation by the Saudis to secure their borders with Yemen, and says that five brigades of the Saudi army and two brigades of the Saudi National Guard – about 25,000 men – are deployed along the border. The "unspoken goal" of this border operation is to penetrate Houthi-controlled areas and eventually advance on Houthi strongholds in the Yemeni governorate of Sa'ada. But, the report says, the Saudis' lack of mobility leaves them highly vulnerable to guerilla attacks. 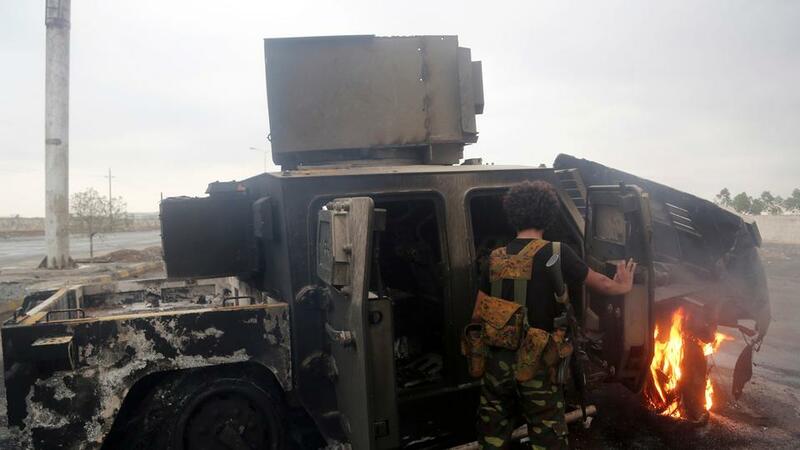 "Despite the defensive means deployed, the rebels maintain their nuisance capability: artillery salvos, missile shots, improvised explosive devices, ambushes and infiltrations into Saudi territory," the report says. The report includes detailed tables cataloguing the type and origin of arms used by Saudi and Emirati forces in Yemen, as well as detailed maps dated September 2018 locating areas where arms had been used in the country. Large portions of Yemeni people live under the threat of weapons produced in France, including tanks and laser-guided missile systems sold to Saudi Arabia and UAE. The report's publication is likely to have significant political implications for the French President Emmanuel Macron and his government, who said, to their knowledge, the use of French-made weapons sold to Saudis was restricted to defensive purposes. France applies strict safety measures, while issuing export permissions, and supports UN efforts for peace in Yemen, a statement by the French prime minister's office said. "Moreover, to our knowledge, the French weapons available to the members of the coalition are mostly placed in a defensive position, outside Yemeni territory or on coalition holdings, but not on the front line," the statement reads. Yemen 4-year war has triggered what the UN calls the world's worst humanitarian crisis, with most of the population in need for a type of humanitarian aid and immediate protection, including 14 million people risking famine and some 1.8 million children suffering malnutrition.